We offer a wide range of hotels near Tranmere Rovers from cheap accommodation to up market luxury hotels. Search our database of hotels to find the lowest rate for your stay closest to Prenton Park. 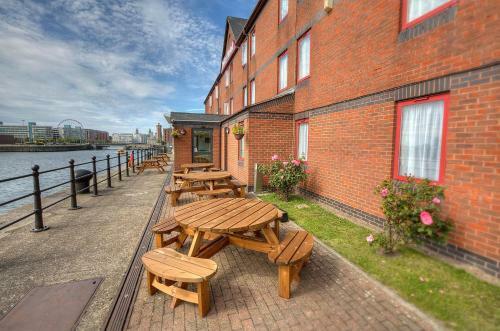 Opposite Echo Arena, Holiday Inn Express Liverpool-Albert Dock has a 24-hour front desk and stylish bar. The hotel is set in a 19th-century warehouse, a 5-minute walk from Liverpool centre. Situated in Kings Waterfront, next to the Albert Dock and directly opposite the Echo Arena and ACC Liverpool, Jurys Inn Liverpool is also a 5-minute walk into the city centre. The property also offers free Wi-Fi access. Overlooking Liverpool Docks, the Campanile Liverpool is located 300 metres from the Echo Arena and ACC Liverpool. It offers affordable rooms with WiFi, a restaurant and free parking. The Dolby Hotel is in the city centre, overlooking the Mersey River. It is a short walk from Liverpool's shops and bars, and has free Wi-Fi and free parking.